But they continue to ignore the biggest threat to their habitat……….. GRAZING. $16 million in handouts for this year alone. The NRCS is handing out more money to ranchers for “habitat conservation” or “habitat improvement” projects that maintain grazing on public lands. There are some projects such as fence removal that will be funded but the proposed seeding projects may require new fencing to keep livestock out for measly the 2 years they recommend and in some circumstances they call for applying herbicides to restrict the growth of sagebrush so that the seedlings can get a foothold. So many times we’ve seen that these kinds of projects are co-opted by the livestock industry to be of more benefit to them rather than the values the funding was made available for. I doubt this will be any exception since they have made a concerted effort to deny that livestock have any role in sage-grouse habitat destruction. A website is set up which lists the projects that the NRCS will fund. One of the biggest threats to sage grouse in the West is livestock grazing and the developments associated with it. Things like fences, which pose a deadly threat to sage grouse that fly into them and provide perches for predators of them and their nests. 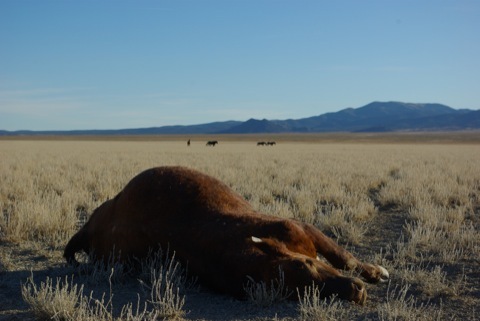 Grazing also has impacts on one of the obvious necessities for survival of sage grouse and that is ground nesting cover. COWS EAT GRASS! Sage grouse need grass too for hiding their nests and young. A recent study makes it plain that managers need to be concerned about how livestock grazing increases the number of ravens by subsidizing them with the carcasses of the livestock and reducing ground nesting cover. The authors point out that current recommendations for nesting cover are too relaxed and that sage grouse benefit from “20 – 30% sagebrush cover and ≥40% total shrub cover”. Cattle also flush nesting and brood rearing sage grouse which keys ravens and other predators in to the location of nests and chicks. In one study of nesting predators the cattle even ate the eggs of sage grouse or caused the grouse to abandon their nests. Cattle and sheep also come with guard dogs which prey on nests as well. In the case of sheep often times herders are not informed of the locations of the leks on their allotments and there have been numerous occasions where bands of sheep have been camped out in the middle of the leks during the spring mating season. Due to political pressure by the livestock industry, the agencies, rather than focus on these impacts, come up with huge “habitat improvement” projects which eliminate sagebrush and piñon/juniper trees which are, in actuality, projects to increase livestock forage. Currently there are a number of projects where the BLM and Forest Service are proposing to cut down “encroaching” piñon/juniper trees in areas where they were previously logged to provide fuel for mine smelters. Rather than “encroaching” they should be considered “recolonizing”. They are also conducting and proposing projects to kill vast swaths of sagebrush, which is the most important component of sage-grouse habitat. If the agencies were sincere about improving or protecting sage grouse habitat they would be doing things to restore and maintain shrub canopy cover which means closing grazing allotments. They aren’t, and they are trying to put lipstick on a pig in an effort to make people think that they are. They are also allowing energy development, like pipelines, wind turbines, gas and oil wells, and their supporting roads and transmission lines, in areas that are important to sage grouse. What are they getting for mitigation for these damaging projects? More fences and water developments which subsidizes livestock operations in these areas. Mitigation should make things better for the environment not make it worse, and it should be mitigation that is more than a bandage. Sage grouse benefit more from leaving the habitat undisturbed but this money will likely be used to do just the opposite in an attempt to keep livestock on the land. All this fuss needs to stop. There are plenty of grouse out there – making an issue of a sub species is ridiculous anyway. As we have learned from the pro wolf crowd, sub species is of no matter – remember, canis lupus is canis lupuis. We’re not talking simply about a sub-species here, we’re talking about an entire species that has declined drastically in the last several years and, when put into historical context, has declined even more drastically. Put simply, this is an indicator species for the sagebrush steppe ecosystem and it indicates the health of that very ecosystem. Your over-simplification of the issue leads me to believe that you simply want to ruffle feathers and have no interest in having any real discussion. Ken – is your assertion that all grouse species are in some form of trouble? I have not seen that info. What are you talking about? The article is about sage grouse not all grouse. Sage grouse consist of one species, Greater Sage Grouse (Centrocercus urophasianus). The habitat they live in is the sagebrush steppe. There may be a distinct sub-species in the Mono Basin and those in Washington State have been isolated. There are numerous other species of grouse and, yes, some of them are in trouble too but this article is about SAGE GROUSE (Centrocercus urophasianus). Ken – do not Ruffed and Sharptails share the same habitat as the Sage? And are they not doing well? Sharptailed grouse are struggling too. I’m not sure about ruffed grouse. Talks with bears- You go around telling people that do not share similar views as you to do more research, then you turn around and state”There are plenty of sage grouse out there”. Nice going. You should run for Congress on the GOP or tea party ticket. William – in the future, if you are going to quote me please be accurate. I stated there are plenty of “grouse”. My point, why all the fuss over one sub species? Are not other grouse sub species moving into the areas vacated by the sage grouse? No. We’re talking about one species here. Franklin’s grouse are not the same species as sage grouse. There are other species of grouse but they don’t live on the sagebrush steppe and they aren’t going to “into the areas vacated by the sage grouse”. I’d argue based on what I saw, that this mechanical treatment, combined with exclosure, had significantly more good quality habitat than the control plots with no treatment. Of course, we realistically can’t go and mess around on millions of acres, but this work certainly suggests that a mechanical “jumpstart” has merit in trying to maintain and enhance sage grouse habitat. One of the big problems with these kinds of studies is the exclosure fencing. It’s a problem for all kinds of species but especially sage grouse. They cause collisions and provide perches for avian predators. The other thing is that if they would just get the damned cows off the lands the lands have the potential, in most cases, to passively recover. Much cheaper. Hmmm….but if you did the treatment on a bigger scale, and then took the cows off for awhile, you wouldn’t need exclosure fences. I’ve seen very little evidence of significant change in the uplands areas that have had cattle exclosures. Not to say that changes wouldn’t slowly occur over 50-100 years, but I don’t know if we have that kind of time to try and stabilize the system, given the encroachment of cheat and all the rest. What kind of habitat improvement did you observe? I’ve always thought it was bad for birds, pygmy rabbits, etc to remove the shrub overstory. I’m not a scientist, so don’t take what I write here as anything more than anecdotal, but one of the interesting things to see on the plots I looked at is the survival of a good percentage of the sagebrush to provide that overstory. The crusher kills the older sage plants, providing for release of native grasses and forbs, but still allows for the younger sage to continue growing. Compared to say, a fire, this kind of treatment may allow the sage to come back much quicker. 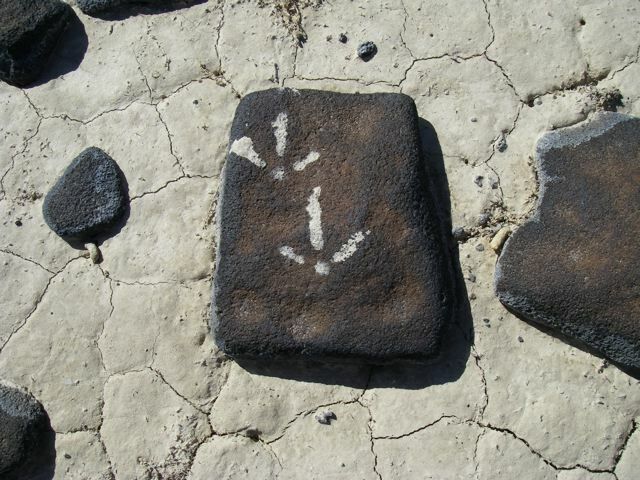 There was significant sage grouse sign (and elk sign) in the treated areas. In order to provide additional overstory, the plots were crushed in strips, so the more open plots were fairly small in size, but close to more mature stands of sagebrush. By no means do I think this is a magic bullet, but it’s certainly thought-provoking to look at. One of the other striking aspects of the plots I looked at was to compare the treated and seeded exclosure with the treated and seeded area that was open to grazing. The lack of grasses/forbs in the open area makes me think that you’d need to take the cows off for a considerable amount of time after doing the work, in order to provide the most benefit. Thank you Tom, very interesting. I just wonder what is the limiting factor for sage-grouse and other sagebrush obligates. Is it grasses and forbs, taller sagebrush for cover, or something else entirely? My guess would be cover, since so much sagebrush has been burned and altered over the years and it takes so long to come back. For that reason I tend to wonder about the wisdom of sagebrush alteration projects. This particular area has not burned in many, many years. It is also fairly remote and unfragmented, with few fences and powerlines. I’d say the biggest thing here in this arid country (less than 8″ precip/year, with poor soils) is the very limited understory, thanks to 120 years of intensive grazing. This problem is compounded because the mature sage plants are taking the majority of the few remaining nutrients, thus making it difficult for the other plants to come back any time soon, without help. Not to say that they couldn’t fully come back on their own, but it might take a very very long time. Do the sage grouse have that kind of time? I don’t know. There are two species of Sage-grouse. The Greater Sage-grouse (centrocercus urophasianus) and the Gunnison Sage-grouse (centrocercus minimus). The latter is smaller and lives in 2 small populations in Colorado. Of course this might have changed since 2003 when my latest bird field guide was published, as they are forever lumping and splitting species. Frank, is CRP, grasslands. and burns detrimental to the greater sage grouse. It seemed to me as a kid growing up wet springs played real havoc with them as well, is it true they won’t renest like some other birds? Si’vet: I believe there’s an ongoing study out of Utah State that is attempting to address the fire question. I’ll take a look tomorrow and see if they’ve published anything recently. Sage brush response to reduced grazing may be slow but cattle damage to riparian areas is also a reason for sage grouse decline. Get rid of the cows, monitor changes, assess needs, treat priority areas ,if feasible, and assess response. But get rid of the cows. Note: I have always refer to sage grouse as sage hens, when I was growing up they were always called sage hens. I would guess that 80% plus of the sage hens found in Montana are on private land. Are you going to tell a rancher that he has to reduce grazing on his private land. The best sage hen hunting that I have had is not in the sage brush but in alfalfa fields. Yes, sage grouse love that alfalfa, especially in the early summer when young birds are growing (and easy to find and shoot! ), but they wouldn’t be there if it were not for the surronding sage brush. No, we won’t rid private lands of cows but the NRCS program this article describes will help sage grouse on those lands. But on public lands in sage brush country, get rid of the cows. JB, do you know if they renest or not? thanks, I also heard today a study with regards to the effects of wind turbines on sage grouse is in the works as well. Sage grouse hens can store sperm. If their first nest fails they can re nest. Sharp-tails are a grassland species, Sage-grouse as their name suggests are tied to sage communities. Where the two vegetative communities overlap you can find both species. There are several areas in S.E. Idaho where this is common. The following are threats facing Sage- grouse. annual grasslands, west nile virus,sagebrush control,wildfires, prescribed fires, livestock grazing,conifer encroachment,fences,isolated populations,agricultural expansion, sport hunting, predation,seeded perennials, human disturbance, infrastructure,insecticides, climate change, mines/landfills/exurban development. (List source Idaho State plan 2006). Thanks Frank, I know that part of Idaho very well, there were many times as a kid we found sage grouse, and sharpies in the same area, but it was always sharpies in sagebrush, never sage grouse out in the real grassy areas. We did however find sage grouse in or in close proximity to remote cut hayfields on several occasions. When I was in high school I shot sage hens in corn fields hunting pheasants a distance from any sage brush. Good discussion here. There are some good papers specific to sage grouse biology on more than one state and federal agency web site. I’ll look them up and post back later. They would answer many of the questions everyone has. For instance, studies have shown that some sage grouse hens will attempt to renest, but renesting is the exception rather than the rule. If I remember correctly, only about one out of 10 hens or less will attempt to renest, primarily because they are a long-lived species and it is in the female’s best interest to restore body condition and survive another year rather than invest more energy into another clutch of eggs with even lower odds of survival as spring progresse into summer and food and cover become more scarce. Wet, spring weather and its effects on the availability of forbs, insects and herbaceous cover is probably the most critical factor to sage grouse reproductive success in their natural habitat. The hens have to have the forbs to get the nutrition they need to produce eggs, and the chicks have to have insect protein for rapid growth, and herbaceous cover, like grasses to hide from predators during the first 2-4 weeks of life. Sure, cold wet weather can cause chick mortality, but sage grouse are adapted to that environment. Predation of nests and chicks and chick starvation are the real threats. Ravens and magpies are the most serious nest and chick predators, along with ground squirrels where they are abundant. They do like to eat alfalfa, and even the leaves of potatoe plants, but not until the chicks are at least 2 weeks old. Insects are the key diet requirement of the youngest birds. It would be an incredibly rare thing to find them nesting or roosting in alfalfa fields, they go back to the sagebrush for that. (I did flush a sage hen from a nest under a tumbleweed once, just a dozen yards or so inside the edge of reclaimed strip mine site – there is always that one exception to the rule). Don’t forget that prior to white settlement there were lots of bison in sage grouse country. Not only did they graze some areas pretty hard, just like cows, but there was also trampling damage to soils and vegetation. Magpies and ravens back then may have been more focused on winter killed bison carcasses or afterbirth from bison calves, ignoring the nesting sage grouse. Now, nesting birds are about all that magpies and ravens eat. But that’s all just blather on my part I suppose. The effects of wind farms on sage grouse have really not been studied much as far as I know. But its my guess that wind farms will have far more negative effects on sage grouse than livestock grazing. Its likely that the grouse will abandon those areas all together, or at least all of the country within a few miles of any turbine. I know for a fact that there are many historic, abandoned sage grouse leks that were once documented as active, prior to the construction of new powerlines in close proximity to them. Were they abandoned because of overall gradual population decline? Or because of the powerlines were constructed over them? I think its an easy guess, and the future is not bright.